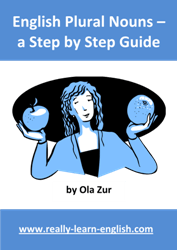 Are you looking for ESL eBooks and teaching materials? Then I'm glad you found this page. 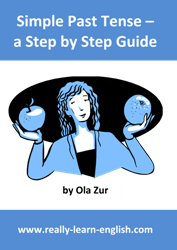 My name is Ola Zur, and I am the creator of Really Learn English. I used my teaching knowledge and years of experience to create the following useful resources for teachers. My expertise is creating simple yet powerful learning aids for teachers and students. 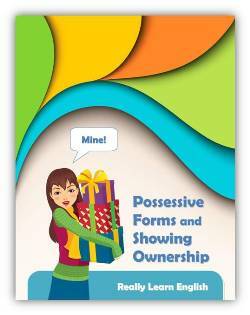 These resources were created by myself and my team of expert teachers and writers. They were piloted and tested on students for best learning results. They are carefully designed to improve the teaching process and make it more effective. These resources will save you many hours of searching for suitable materials (or writing them yourself), and help you achieve the best results with your students. In addition, there is no need to wait.  You will be able to download the eBooks instantly. Really Learn English is a well-known and loved website for teachers and students around the world. I hope you and your students will find it useful too. Feel free to go over the different products and choose the ones that best fit your needs. This is our complete set of digital stories, exercises, books, booklets, workbooks, answer keys, worksheets, activities and dialogs for English teachers and students. Huge discount: by purchasing the complete set, you are getting all of our products, at significantly lower cost (about 40% less). Moreover, you are getting additional resources, not available anywhere else. This package includes all the products you find below and more. 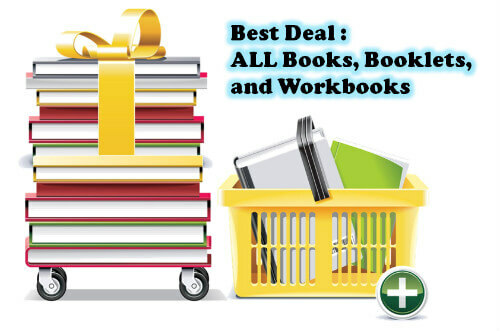 It's our best deal for teachers and students. The Simple Tenses Series: a unique series of five books. It contains a book for each simple tense, a book for all the simple tenses mixed, and an additional book for speech practice of these tenses. Simple present rules and tables (positive sentences, negative sentences, questions, special verbs, and correct usage). 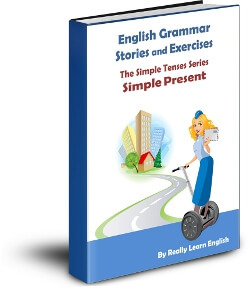 Simple present grammar exercises to practice correct usage and when to use this tense. Simple present rules exercises to practice correct sentence structure as well as correct verb spelling. Five special short stories with illustrations, written in the simple present tense only. That way the student and teacher can concentrate on reading and practicing this tense specifically. 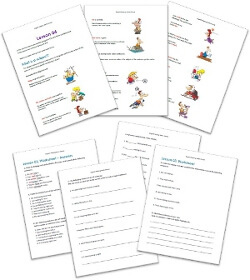 Special exercises before and after every story to practice story vocabulary, sentence structure, simple present grammar rules, comprehension, and writing skills. 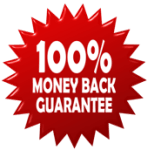 Your purchase is safe with our 100% Money Back Guarantee policy. 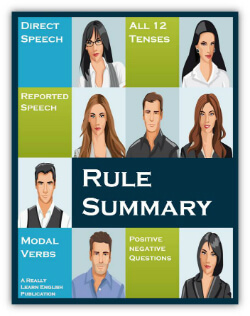 Simple past rules and tables (positive sentences, negative sentences, questions, regular and irregular verbs, and correct usage). Simple past grammar exercises to practice correct usage and when to use this tense. Simple past rules exercises to practice correct sentence structure as well as correct verb spelling. Five special short stories with illustrations, written in the simple past tense only. That way the student and teacher can concentrate on reading and practicing this tense specifically. 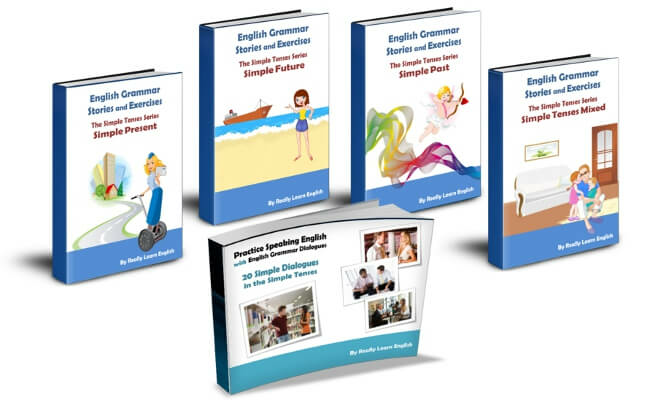 Special exercises before and after every story to practice story vocabulary, sentence structure, simple past grammar rules, comprehension, and writing skills. Simple future rules and tables (positive sentences, negative sentences, questions, special verbs, and correct usage). Explanations, examples, and exercises on "Will" versus "Be Going To" and when to use each. Simple future rules exercises to practice correct sentence structure. Five special short stories with illustrations, written mainly in the simple future tense. That way the student and teacher can concentrate on reading and practicing this tense specifically. Special exercises before and after every story to practice story vocabulary, sentence structure, simple future grammar rules, comprehension, and writing skills. Five special short stories with illustrations, written in the simple tenses only. That way the student and teacher can concentrate on reading and practicing these tenses specifically. As with the other books in the series, there are no progressive or perfect forms of the verb. 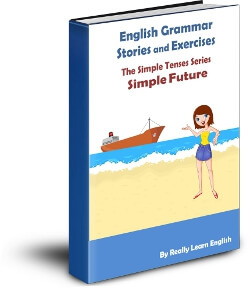 Buy the entire "English Grammar Stories and Exercises, The Simple Tenses Series" and get it at a 50% discount. 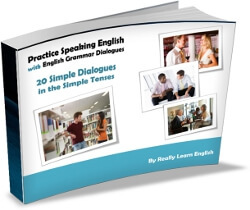 You will also get a special bonus: "Practice Speaking English with English Grammar Dialogues" free of charge. 148 pages of explanations, rules, exercises, stories, and lots of practical practice. This is a crucial addition you must get. ALL the answers, to ALL exercise, including: writing exercises, hands-on practice, homework units, and the final test! Use it to easily check your students, or help them check their own answers. Spice up your lessons with these fun yet instructive activities. Use whenever you have a gap to feel, the students seems less "lively" or the lessons becomes "dry." Just open up the class activity booklet and bring your class back to life. It's testing time! Easily grade your students using this final test and its elaborate point system. 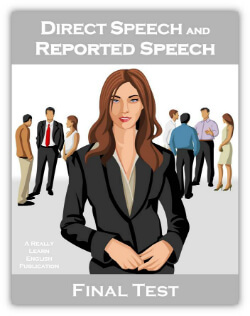 A separate booklet with ALL the rules, not only for the reported speech, but for ALL the tenses. Everything is usefully organized in one central location. For your or your students' use. Would you like to use our online stories with your students or in your classroom? You can! Get this downloadable book. It has all the online stories of Really Learn English, plus five bonus stories not available anywhere else. Print the stories and use them with all your students. 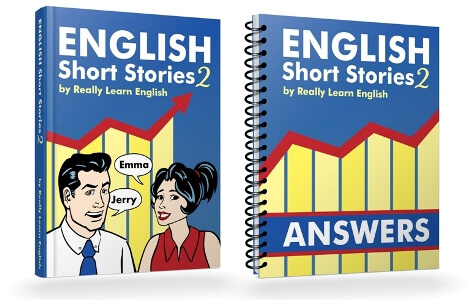 Make your English teaching effective and fun with our popular English short stories. 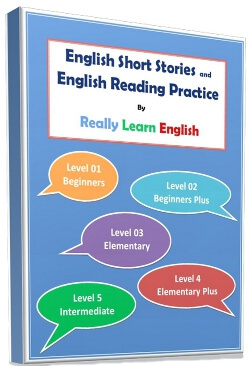 110 pages of high interest/low vocabulary stories, as well as many types of exercises for your students. The exercises include vocabulary, sentence structure, grammar, comprehension and writing. The second book in the "English Short Stories" series. It has many stories about Emma and Jerry, a married couple, and the funny everyday situations they go through. 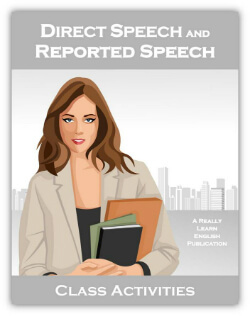 208 pages of high interest/low vocabulary stories, as well as many types of exercises for your students. 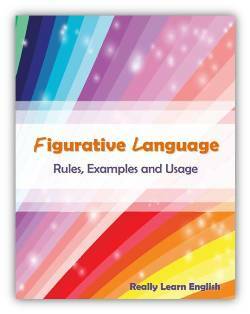 The complete guide to figurative speech and writing, including: similes and metaphors, idioms, clichés, puns and others. 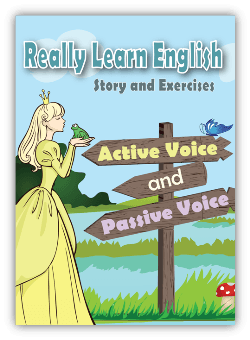 Rules + story + exercises + answers to teach and practice the active and passive voice in English. 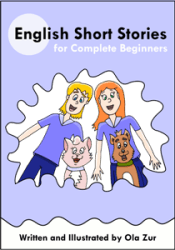 54 pages of fully illustrated stories for complete beginners or kids learning English. It is useful for teaching reading, basic sentence structure, and practicing basic sounds of letters. 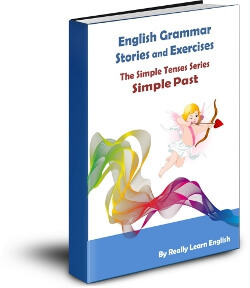 A complete tutorial on the simple past tense. 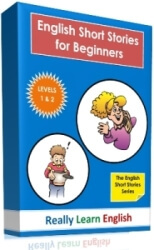 Includes easy to follow explanations, dozens of different exercises, a story in the simple past tense and a final test. A complete tutorial on English plural nouns. Rules and practice for the spelling rules, irregular plural nouns, countable and uncountable nouns and much more. 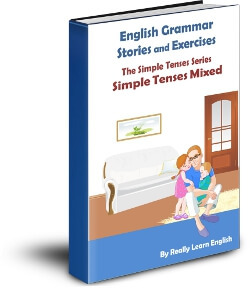 Includes easy to follow explanations, dozens of different exercises, a story in the simple past tense and a final test. You can use it by yourself, or even better - with your students. Many students feel confused on this important subject and this course helps making it simple. 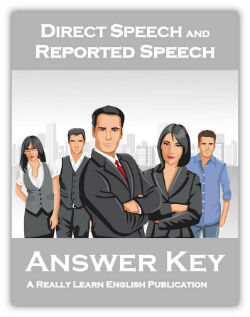 The course includes illustrated explanations, examples and exercises + answers. 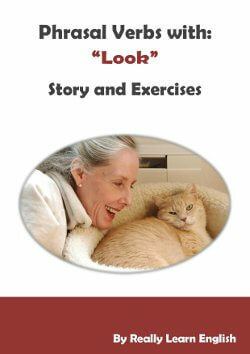 Teach common phrasal verbs with "look" in an easy, step-by-step approach. Rules, definitions, and a summary table for four common phrasal verbs with the word "look." Exercises to practice the phrasal verbs. Only available to buyers who refer new buyers. Click here to learn more about it. 287 pages of illustrated short stories, starting from the most basic words and sentences. Each story is very short, and you get many of them! A comprehensive grammar test for intermediate students. It covers the most important aspect of grammar: parts of speech, verb tenses and sentence structure. If, at any time, during the first 30 days after your download, you are not satisfied with the product, just let us know and we will give you a full refund, no questions asked. Visit our NEW store to get even more eBooks and teaching materials! Is the product you are looking for not here? Are you looking for a product on a different subject? 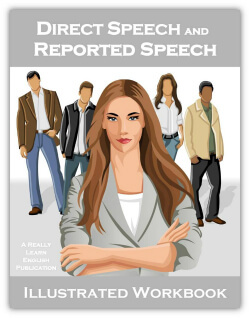 A different type of an EFL/ESL eBook? Are you missing some teaching materials you would like me to make available for purchase? Feel free to write and let me know. What materials would you like to have available for purchase? Please give as many details as possible to make sure your request is fully clear.